Tis’ no secret that SI has a passion for all things sweet. Come they in the shape of our favorite Hollywood actress Jennifer Lawrence or come they in the form of Indian Burfis, Kheers and Halwas or American Brioche French Toast, crepes and pastries, we love ’em all. So when the American restaurant chain IHOP launched three varieties of Brioche French Toast yesterday, SI hotfooted over to the nearest location. Barring some minor snafus, overall the 30-mile round-trip was worth it . 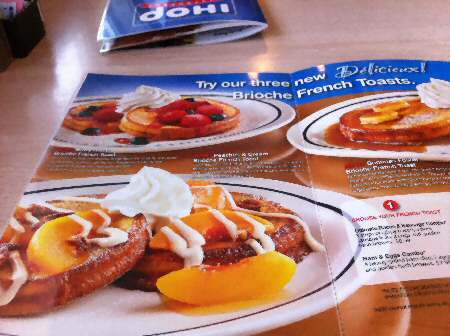 Launched on April 15, 2013, IHOP’s Brioche French Toast comes in three flavors – Berry Berry, Peaches and Cream and Bananas Foster. Though positioned as a breakfast item, Brioche French Toast is available all day. Brioche French Toast is available both as a stand alone item ($5.99) and as a combo with Egg ($6.99) Bacon & Eggs, Sausage & Eggs, Ham & Eggs ($7.99), ultimate Bacon & Sausage ($8.99). Since SI loves Berry Berry and Peaches more than Bananas, we ordered the Berry-Berry Brioche French Toast ($5.99) and Peaches & Cream Brioche French Toast Egg (over hard) Combo ($6.99). What’s a visit to IHOP without indulging in their Crepes. So Garden Stuffed Crepes ($7.99) and Strawberry Banana Danish Fruit Crepes ($7.49) and Coffee were added to our order of Brioche French Toast. Lukewarm Coffee landed on the table in a flask along with a mug within two minutes. It took about 25 minutes for Brioche French Toasts, Savory and Sweet Crepes to land on the table. They were all served together. 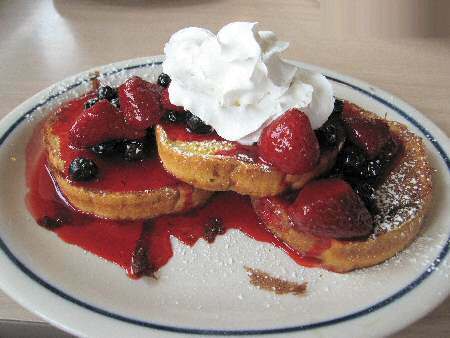 Berry Berry Brioche French Toast included three thick round slices of french bread toast on a bed of strawberry sauce. It was topped with strawberries, blueberries, whipped cream and powdered sugar. Brioche Bread is more of a snack, if you ask me. Not for those with robust appetites! Berry Berry Brioche French Toast was yummy both in the presentation department and taste-wise. Neatly grilled, the bread was a delicious treat that quickly melted in the mouth. But I’d consider the $5.99 price a trifle high. 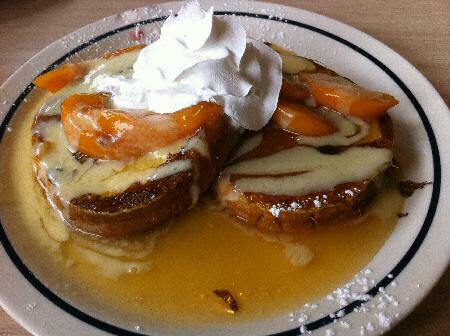 As requested, our Peaches & Cream Brioche French Toast sauntered in as a combo in the company of eggs and hash browns. Peaches & Cream Brioche French Toast Egg combo included two thick round slices of french bread toast, sitting prettily on a bed of peach sauce. It included six peach slices, vanilla cream and whipped topping. Peaches & Cream Brioche French Toast was delicious and disappeared in no time. 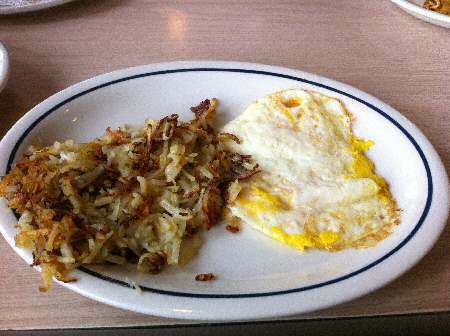 But IHOP shortchanged us by not including the crunchy honey-roasted pecans promised in the menu. Such misses suggest an inept kitchen still struggling with the new items. 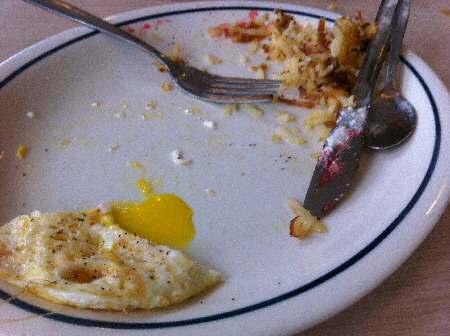 As if that was not enough, the eggs were disappointing. Our request for over hard eggs on both sides fell on deaf ears. Hash browns though crisp were salty and we did not relish it one bit. Come on, how difficult is it for a kitchen to get the hash browns right? A bit disappointed with missing crunchy honey-roasted pecans, the messed up over hard egg and salty hash browns, we shuffled over to Garden Stuffed Crepes. Priced at $7.99, Garden Stuffed Crepes included two crepes with spinach, mushrooms, egg and cheese stuffing and topped with hollandaise and diced tomatoes. Although mushrooms overwhelmed the other ingredients, the Garden Stuffed Crepes were still a flavorful delight. Strawberry Banana Danish Fruit Crepes included two layered crepes with strawberry and cream stuffing and strawberry, sliced banana and whipped cream topping. Kids will go delirious over this! Be warned though that this item is too rich in calories, as with most items we ordered during our visit! If a restaurant can’t deliver on hot coffee, the kitchen staff should pronto be dispatched for retraining. IHOP was found badly wanting in the coffee department. One of the reasons I so love diners is because the coffee is piping hot. Our waitress was clueless about the price of the non-combo version of the Brioche French Toast. “I have no idea,” she proudly told us and returned a few minutes later with the information! Thankfully, our other waiter was a better informed fella who went out of his way to be helpful. I’d recommend the combo deal for the Brioche French Toasts as they are better value for money. 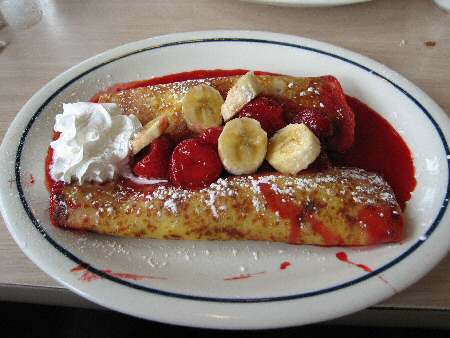 3 Responses to "IHOP’s New Brioche French Toast – Yummy"
The ‘strawberry banana danish fruit crepes’ looks mouthwatering. Looks like a vampire’s dessert. The garden stuffed crepes also looks good. I personally don’t prefer hollandaise sauce. But the rest looks good. Btw SI, please check your email. 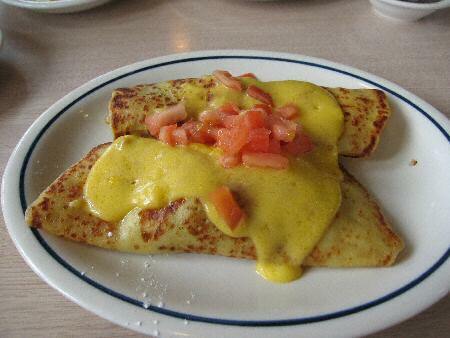 Strawberry banana danish fruit crepe does taste real good…..Went to IHOP after nearly a decade. I’ll respond to your note in a few minutes! Just responded to your note! Dennis Miller is a bilge-spewing whacko who fits in well on the whacko Faux News Channel. Of all the sick f*cks in the world, Rupert Murdoch has got to be the sickest! 🙁 Bill O’Reilly, Dennis Miller, Sean Hannity et al are mere cogs in Murdoch’s satanic wheel. Barney Frank and Obama deserve canonization when compared to Murdoch and the rabid conservative beasts/hosts who throng his trashy channel. These crepes and brioches may be snacks but their calorie count seems to exceed what we should be eating in one sitting. I mean some of them seem to have half the daily required calories for a sedentary person. We go there once in 5 years or so….